I have always been a fan of aviation adventures and have recently been caught up in following Barrington Irving's World Flight Adventure. 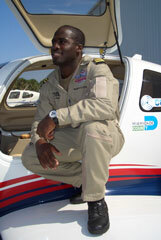 Irving is looking to be the first person of African descent and to be the youngest person ever to fly solo around the world. Barrington grew up in the inner city of Miami and was 15 years old when he met an United Airlines pilot that got him excited about flying. He began spending his free time at the airport, working to pay for his flight lessons. Aviation has been his passion ever since. In 2005 he founded Experience Aviation a nonprofit organization that looks to inspire the young people and encourage those interested in pursuing careers in aviation. You can learn all about the organization on their website. Irving has flown over 14,000 miles already in "Inspiration" his trusty Columbia 400 and has another 6,000+ miles to go. The next leg will likely be his most challenging. According to Irving's blog he is in Hong Kong waiting for storms to clear to allow him to make the challenging flight across the North Pacific to Shemya, Alaska. The next leg of the flight will take nearly 12 hours to cover the 1,520 nautical miles. You can view a map tracking his flight progress on the Experience Aviation website. Judging from the satellite imagery he shared on his blog I have a feeling he might be grounded for another few days while the weather pushes off to the East. If you are intrigued by Irving's flight you should also check out Three Eight Charlie the story of Jerrie Mock's flight around the world. She was the first woman to fly solo around the world. I created a Google Map Mash-up of her route a while back. As a Jamaican teacher in America, I was very proud to read of your accomplishments and inspired by them. I now have another example to hold up to my students to let them know that they can achieve if they have the drive and the perseverance to do it. Poverty does not have to be a hindrance to the height they are able to attain. I applaud you for your achievemants and hope you will continue to inspire young black boys across the world. Congratulations and thank you. All people deserve good life and credit loans or car loan will make it better. Just because freedom relies on money.